Paying off the mortgage early is a hot topic when it comes to money management. There seems to be a good amount of quality logic for keeping it and equally valid logic for paying it off early. So what’s a homeowner to do? Then during 2010, some things started to change in our lives and we began to rethink our strategy. After much debate, we decided to pay off the mortgage early. The reasons may surprise you because only one of them was based on a mathematical concept/equation. Let me preface what I’m about to share by saying that we could not have paid off the mortgage early unless we had the extra money to do so. That’s seems obvious, but I think it’s an important point to make. We reached that point in our lives where all other debts were paid and the other aspects of financial planning – emergency fund, kid’s college, retirement – were being covered. So that freed us up to throw extra money at the mortgage. We moved money to the mortgage balance from our excess monthly income, from our rental property income, from tax refunds, from investments and from any other money we could get our hands on. All in all, it was a four year journey to complete once we finally became serious about it. Here’s why we did it. Sometimes a person takes a stand or makes a decision based on a personal conviction. In those instances, nothing else really matters, not even a mathematical equation that shows you might get a better return on your money elsewhere. Some in the personal finance world might think I’m talking blasphemy here and giving bad advice – that I let my emotions get the best of me instead of thinking logically. I understand all that. I also realize the peace I feel over this decision makes me not question its legitimacy in the least. The conviction for us to be paying off our mortgage early came from what many would consider an unlikely source – my faith. In 2010, I embarked on a personal journey to read through the Bible and catalog all the verses about money I could find. What I found astonished me…over 400 passages (many with multiple verses about money) in all. It was on that journey that I felt God convicting me about being in debt. This wasn’t anyone’s program, the advice of a friend or the nudging of a spouse prompting me to get rid of debt. It was a spiritually experience and highly personal. I really can’t explain how God works in the hearts of people. I just know He did in mine on this issue and I couldn’t ignore it. Lest you think this was a one-sided affair, when I shared this with my wife Kim, she got on board quickly. For me, that served as confirmation I was hearing and thinking the right things. I probably would not have moved forward if we hadn’t agreed. Turns out, God was working on her as well. I mentioned in my Monday post about our mortgage payoff that Bank of America purchased our loan from Countrywide. That happens all the time as banks and investors sell and buy them for various reasons. For the consumer, it’s a little annoying but we mostly adjust and move on. Because BOA had our loan, we opened a checking account at a local branch. This way we could electronically transfer money from our main account at PNC (or an investment account) into our BOA checking account. We could then make another transfer from the BOA checking account to the mortgage account to pay that down. Easy enough, right? I found out after the fact that I couldn’t transfer in from my PNC account more than $1,000 without using BOA’s SafePass system. This system sends a secure, one-time use code to your mobile device as a text message every time you try to make a transaction BOA codes as sensitive. In order to finish the transaction, you need to enter the security code. It’s free for mobile phones, unless you are paying for text messages, which I was when we started. Either way, this “free” service would cost me money every time I made a transfer (unless I broke the larger amounts up into multiple transfers each under $1,000…which I of course did.) It’s simply an example of a hoop a borrower has to jump through that causes frustration. I’m not going to elaborate on the other big issues I dealt with like the poor customer service I received, the impersonal nature of BOA and the rude clientele at our local branch. All the big and little issues simply add up after awhile. Those issues caused us to become fed up with dealing with our lender and become all the more motivated to paying off the mortgage early. I don’t think this issue needs much explanation. Everyone understands the issue of paying interest over the life of a loan. When I took the time to do the calculations and really processed what it meant for my financial future, it made me sick. I couldn’t bear paying that much extra in interest and it really helped motivate me to be paying off the mortgage early. As you can see, the blue line represents the principal of the mortgage paid. 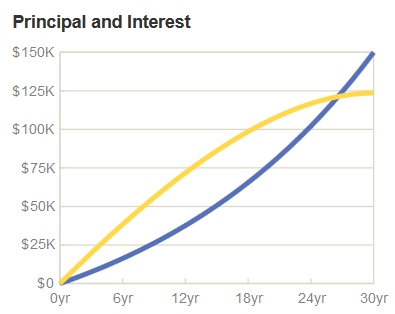 The yellow line shows how much will be paid in interest over the same time frame. In this example, the interest paid is almost as much as the original loan amount. About the same time I was getting frisky about paying our loan off, my wife was embarking on a different journey of her own. She had decided to make a career change from math teacher to CPA. It would require her heading back to school to get an accounting degree and then passing all the necessary tests to acquire her CPA license. When she began, we really didn’t know what would be in store for her. The prospects for work in that field are good but there is always a level of uncertainty in how the future plays out. At the minimum we hoped she would be at a new job in three years, a job that might have significant impact on our financial lives. Not knowing how the future would unfold, we decided to save money and reduce risk as much as possible. We kept our budget tight, bolstered our emergency fund, and purchased additional life insurance coverage. In our minds, we wanted to have the flexibility and freedom to make choices along the way. It’s tougher to have flexibility and freedom when tied down by a big mortgage bill. Having the freedom to make financial and lifestyle choices is one of the biggest reasons for paying off the mortgage early. Without that burden weighing the budget down, a person’s options for use of their money really opens up. After just a few short months of being debt free, I’m already seeing how more can be thrown at investing for retirement, given to charities, spent on family activities or used for really anything you want. I can’t say whether my reasons will be right for you. Paying off the mortgage early, is a highly personal decision. You will have to assess your situation to determine what’s best. All I can tell you is that the air smells a lot cleaner from where I’m now sitting. I’m really looking forward to the debt free journey ahead. Questions: Have you ever made a financial decision based on a personal conviction? Does it make you sick to see how much interest accrues on a mortgage? What hoops have you had to leap through as you’ve paid off debt? Do you feel like your mortgage has you financially stuck? Have you ever considered paying off the mortgage early? Prior Post: Goodbye Mortgage and Lender B.O.A. Hello Baby Step 7! Thanks for putting into words your thought process. Often we try to “game the system”, and having the extra money invested versus paying off the mortgage -is- a fine financial strategy. But it’s still debt! And I’ve never heard of anyone who regretted paying their mortgage off early. In the end, I think of it this way: If the house was paid for, would you want to take a mortgage out and invest the money? Probably not! Thank you for sharing the article. It’s very useful. Hope to hear more from you. When I was paying off debt, I made some decisions on how I was going to do it that likely others wouldn’t have agreed with. Being free of debt allows you to explore more choices with regard to how you want to live your life as evidenced by your wife being able to return to school and have a new career. If I ever choose to have a mortgage again, I will pay that off as fast as possible! Again congratulations to you and your family! Thanks Kassandra! Lack of debt sure does bring freedom and options. We’ve really started to feel that the last several months. Congrats! I am all for paying it off early. I have been writing about mortgages a lot lately. Everything from “why you should pay it off” to “a compromise between paying it off vs investing the money”. It’s more than just a financial issue. There are countless reasons to pay off your mortgage. Good job on knocking it out! Thanks Kalen! I agree obviously…it’s not all about the money. We did continue to invest along the way as we paid down the mortgage. We prepaid our old mortgage heavily, and we continue to prepay our new one. I haven’t done the math, but we’re paying about 40% more than our mortgage every month and it’s only a 15 year mortgage to begin with. We do it for the same reasons you’ve mentioned. I hate debt, interest, making payments, etc. I also don’t like being beholden to anyone. That’s going to pay off pretty quickly and save you tons of money in the long run. I like it! That sounds like it was tough decision. The prospect of making less income to pursue that dream must have been difficult to overcome. I was talking with Kim last night about the tax advantages to a mortgage that so many people cite as the reason to keep it. The amount of money you save on taxes is negligible compared to the interest one accrues on a loan. We pretty much don’t make financial moves ONLY for tax purposes. I’m actually not surprised at this -> “The reasons may surprise you because only one of them was based on a mathematical concept/equation.” I think most of the time when someone decides to pay off their mortgage early it has more to do with some of the personal things you mentioned than with a financial equation. I also absolutely understand what you are saying about personal conviction from God. God’s calling won’t always make sense financially or based on equations. As someone who has student loans, an auto loan, a wife headed to grad school, and a mortgage, I can say that it’s inspiring to see someone pay off all of these things. It’s hard for me to imagine being at that point, but I hope to be in a place that paying off all my debt is an option. Maybe you are right about more people doing it for personal reasons. I’m certainly one of those. Perhaps it’s just my immersion in the PF world that makes me think people always look at the math first. Keep knocking off the debts one by one. Slow and steady wins the race. You will eventually get there my friend! I’m a firm believer in doing what will make you happy, even if the math doesn’t add up. I’ve never had a mortgage before, but I know it caused my parents a lot of stress when we were at our old house. I’m sure it feels much better not having to worry about debt whatsoever! Especially with that graph showing the interest paid…awful. Mortgage = creator of stress. Yes! For that reason there is no rush to get one. I’d rather rent and save money for a down payment until I was ready to handle the burden. Debt IS servitude, but the reason I paid off my mortgage 20 years early was because of a bank clerk who refused to waive a $50 late payment fee. The bank got its $50 in the end, but it lost tens of thousands in interest payments that it would have received had the mortgage continued. Love it! If banks only knew how much this type of behavior ticks people off. They are probably thinking, “That’s our policy and it’s only 50 bucks.” Meanwhile the customer is raging. Good for YOU!!!!!!!!!!!!!!!! LOVE IT! They offended you over $50 and you paid them back by offending them by $10,000+! Good. for. you.! #2 is the sole reason we’re paying off our mortgage early. In fact, we have an appraisal this Friday to refi from a 30-year fixed to a 15 year-fixed. This will lower our interest rate and monthly payments and shave 8 years off our mortgage even if we don’t pay the 15-year fixed offer early. The sooner we have $0, the sooner we retire. That sounds like a great deal! It’s absolutely maddening sometimes what lenders put borrowers through. There are so many hassles. Thanks for sharing the reasons behind your decision Brian. We’re feeling very similarly in regards to having that conviction that we don’t want to be obligated to someone else. We weren’t there when we bought our place, but now that we run the business we don’t want to have to owe anyone. We want that flexibility to be able to do as we want and not be tied down to a mortgage or anything else. With as much as you’ve shared how your business fluctuates in income, I can see how you would want to clear away all debts. I really believe conviction trumps numbers, although many would disagree with that. We’re with you on this one, Brian. We too will be paying our mortgage off early, and the sooner, the better. We just love the freedom it allows for, knowing that you “owe no man”. Thank you for sharing Brian and congrats again on reaching your goal! I think no matter how people feel about paying off their mortgage, it is important as you say to have a conviction about your money and to make a plan and stick with it. I know that this journey was not an easy one for you and your wife, but you stuck with it anyway and now you are benefitting from your conviction. I appreciate those thoughts Shannon. Without conviction – and this applies to any area of life – we will shift as the winds change, following any idea that we may come across that sounds good. I’ve avoided making many mistakes by sticking with what I believe in. Love, love, LOVE that you’ve done this. Major Congrats! Keep inspiring people.